Last week I attended a Fair Use and Digitization workshop at Bowling Green State University. 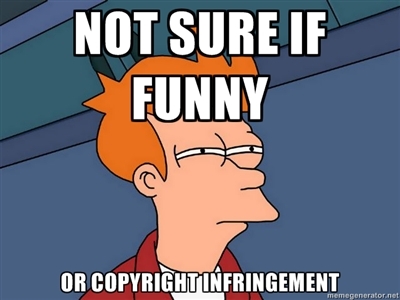 We learned a lot about copyright (does that make you cringe? I did, just a little.) and Fair Use. The workshop provided some excellent food for thought regarding Fair Use (you can read the ARL Code of Fair Use Best Practices here), Orphan Works, Digitization, and Copyright Risk Assessment. While I could go on for days about access (I can’t lie, I take a pretty liberal stand on the subject) I want to connect the conversation of copyright and photography policies at museums with this week’s ARTnews article, “Why Can’t We Take Pictures in Art Museums?” and Wired Magazine’s recent article, “1993”. We’ve all been there; well, most of us have. You’re looking… no, you’re staring… no, you’re getting lost in a piece of art. Maybe it’s an artifact, maybe it’s an old document, but you get the idea. You’re mesmerized. And you feel the need to grab your smart phone and capture this moment (this is totally different than that silly HTC First commercial, by the way. This isn’t a, “Us girls going dancing tonight” moment, it’s a “Girls, look at this beautiful piece of art. Wish you were here” moment). If you’re a museum professional, you may pause and respectfully (or furtively) look for a guard. You may even seek one out to ask it photos are permitted. Or maybe without a guard in sight you quickly capture the photo and stealthily put your phone away like nothing happened. Whatever the case, you feel that certain tug, and inherently you want to take a picture. You want to remember your experience. You want to capture your experience. You want to share your experience. I am fascinated by the range of photography policies that exist out there. While some museums encourage photography, others do not permit it at all. Special/traveling exhibitions can be a different beast all together. Why so many rules? The simple fact is that museums do not necessarily own all of the collections they display, or the owner of the material did not own the copyright when the transfer occurred, which can be a difficult concept to understand if you don’t live and breathe in the museo-world. It’s a little like having your rich uncle’s Aston Martin in your garage, with no keys. While you can appreciate it, and are excited to show it to all of your friends, it is not yours. You can’t drive it (this particular metaphor is for my husband – cars are a concept he understands much better than museums). Also, please note: we do not have a rich uncle, no matter how much we try to find one. The ARTnews article, “Why Can’t We Take Pictures in Art Museums,” does a great job of outlining the “loosening” of photography policies, quoting Nina Simon, Alisa Martin, and Brooke Fruchtman (among others), discussing restriction, enforcement, social media, and the “read-write culture” driving these conversations. The article also shares an extreme instance in which a visitor, took pictures throughout the Indianapolis Museum of Art (even in the restricted areas) and then attempted to sell them online. In point of fact, the risks are real, but so are the realities. In the age of Tumblr, Google Art Project, OpenGLAM, Flickr, Instagram, and participatory culture in general (not to mention the internal push many museums feel themselves to use these tools to expand the reach of their collections) – how can museums best gauge and manage a copyright risk assessment plan? So, what is the risk of taking photos at an art museum? What is your institution’s photography policy? Why is it in place? Do you agree with it or disagree? While I certainly don’t see copyright going away – we all deserve credit for our unique, creative works, right? – the rules of copyright may be forced to change in the face of the coming, even more connected, Digital Generation. Tags: Alisa Martin, ARTnews, Bowling Green State University, Brooke Fruchtman, Copyright, Digital Generation, Flickr, Google Art Project, HTC First, Indianapolis Museum of Art, Instagram, Jerry Adler, Nina Simon, OpenGLAM, photography policies, Tumblr, Wired Magazine. Bookmark the permalink.